The brainchild of Bradley Bills; my first encounter with the project Chant, was witnessing him assisted by cohort Alvin Melivin, live at the UK’s Infest. With them being the weekend’s finest act by a mile, there was a lot to live up to on record; and luckily this latest album more than matches them in the live arena. It would be lazy journalism to spout that the opening title track owes a lot to NIN; but in all fairness, it does. This is no bad thing of course and Bills does more than enough to make it his own. There’s a distinct 90’s British indie flair that rides through Chant, blending well with the old school American Industrial charm; with ‘Cycles’ and ‘Manifesto’ providing a riotous romp that tear through the speakers with gusto. A prominent factor in Chant’s work are the analogue rhythm sections, which pound hypnotically throughout all of ‘Brave New Apocalypse’; and are the essential ingredient that gives Brads project the edge over many pretenders to the crown. Coupled with clinical programming and razor tinged guitars, there isn’t much not to like with the outcome. I have been somewhat disinterested in the Industrial scene for some time if truth be told (years even); and it has been some time since I actually put a record on of that ilk for pure listening pleasure alone (as opposed to just for reviewing). Chant have changed the mould for me somewhat, in that I have happily blasted this out of the hi-fi on more than a few occasions now, which is no mean feat, considering how dire and uninteresting I view the current circuit. There is a lesson out there for all those acts just starting out in the Industrial scene (indeed some of those that have been around a while); and ‘BNA’ is a clinical lecture in how to nail it bang on the money. The third and final instalment in this series of thematically stringed releases, sees ESA’s Jamie Blacker shift stable from Tympanik Audio, to the ever expanding roster of US label WTII Records. However, nothing has altered in the transition sound wise, as Blacker brings to us what is most likely the strongest episode in this trilogy. ‘Men Will Only Break Themselves’ punches its way into existence with a clenched fist; that evolves into a jarred eruption of industrial sensibilities. Carrying an underlying dance edge, there is an evident progression in programming techniques; displaying Blacker’s ability to mix the commercial with an undercurrent of unnerving sampling. ‘Be Still and I Shall Tell You Why’ epitomises what ESA does best; a pulsating distorted beat-fest that speeds through Industrial waters with brutal abandon, seamlessly flowing into the heart stuttering ‘The Tempters Triumph’. The pace slows somewhat as the sinister ‘Master, No Servant’ changes tack; with atmospherics carrying the track on a wave of bleak pads as a wall of beats and electronics throw jab after jab. In contrast, ‘What the Devil Did’ is a more electronic affair that is wrapped in a cleaner aesthetic, sonically speaking; with an off kilter wire-like thread to tie it together. ‘My Church’ utilises one aspect of Blacker’s influences, with a Dave Vincent-esque growl accompanying yet another of the albums excursions into none stop barrages of rhythmic noise; that is tempered with the soundtrack church organ romp, that is ‘Threnody For You’. The title track follows on at a relatively serene pace compared to its counterparts; and the guest vocals of Magenta.S provide some welcome respite from the continual smash in the teeth that ‘Themes…3’ provides to this point. ‘Juju Yako’ and ‘Fenetre’ signal the end of this album, as the pace slows and shudders to its inevitable conclusion; with a sea of complex electronics bouncing between a bed of marching rhythms and grinding screeches, providing a fitting full-stop to the many years of work that went into the creation of this trilogy. All in all, ‘PENANCE’ is a crushing affair, with Blacker wanting to end the story on an explosive high. As a collection ‘Themes…’ works effectively as a whole package, as well as each album does on their own individual merits. 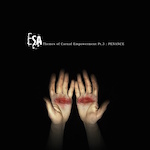 I am impressed as always and this album does beg the question as to where ESA goes from here; and I seriously hope the end of this tale doesn’t signal the final bell in what has been a great run of albums thus far. 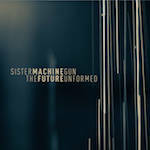 Everything goes full circle of sorts as Chicago Electro-Rock semi-legends Sister Machine Gun find themselves on a label with the DNA of Wax Trax! Records. After four albums from the pioneering label and a further six on their own base, Positron!, it seems fitting that they now find themselves a new home on Wax Trax II. What we have with ‘The Future Unformed’ is a nod at past glories, with an injection of newfound energy and positivity that I felt was needed to stop the stagnation, which in part was coming from the scene in general; and with five new tracks as a resurgence to form, I can only imagine that we may be due a new wave of old school American Industrial, that harks back to the ethics that Jim Nash and Danny Flescher envisaged way back when; which should be now safe in the hands of Bart Pfanenstiel and Dave Schock. It’s fair to say there isn’t a dud track on this EP at all, from the rip-roaring ‘Insect’, slick ‘Coldstar’, the punching statement of ‘Protest’, old school ‘Subgod’ and the oozing creeper that is, ‘Closer’. Five tracks that are invigorating and essential for anyone with a penchant for an age where music mattered, let’s hope we see a new full-length release soon; and I couldn’t think of a more fitting label for it to be showcased on. With this latest studio album this Pittsburgh duo have made Chicago based WTII Records their home. It’s fair to say that PB fit well into a roster that planned to take off from where the legendary ‘Wax Trax!’ label left off, fitting more into this ethos than a lot of the acts preceding them promised. The opening title track holds more to US electro industrial than previous affairs, with years of stateside heritage soaring throughout its veins in the form of catchy hooks and a punchy, riotous beat, alongside effectively treated vocals; this is further capitalized on the chant-along lyrics of ‘inTerruptOr’. The mid 80’s to early 90’s were critical in forming the classic Americana style of Industrial and this has been typified in the 4-4 synth oriented pulsating ‘We R the Gods’, bringing to light those elements that made KMFDM great (before they turned into a bad metal cliché) and My Life With The Thrill Kill Kult fun to pump out of your speakers, before heading to some seedy club in the middle of nowhere. Vocally Nikki Telladictorian may not be the strongest when it comes to outright singing, but this is where PB have ultimately shined. Rather than overwork her output, the lyrics are sometimes spat out with venom and more often than not, sleazily drawled out with a charismatic sincerity. A strong front-woman persona that places Prometheus Burning in the fortunate position of an act that rather than being mocked for its approach, should stand the test of time. The only downside to ‘Kill it with Fire’ is the obvious comparison with many electro artists you will have undoubtedly heard many times before, musically speaking. However, as a whole this latest instalment displays passion in relishing this approach, coming out smelling of roses where so many have stank out the joint over and over again.